TO GOD BE THE GLORY IN THE NAME OF THE LORD JESUS CHRIST!!! HAPPY NEW YEAR 2018!! AND HAPPY EASTER 2018!!!! We send warm greetings from the People For Jesus Ministry (PFJM) Church family. The Lord is surely faithful and His mercies endure forever. It is paradoxical that 3 months are already gone in the brand new year. God is good to us and we truly appreciate your partnership that has been an integral part of the ministry reaching thus far. The whole Church has been engaged in many aspects of ministries and services locally, regionally and globally but we have just given a summary of what we have done in the last three months which is not exhaustive. The Church continues to work in communities with many poor orphans, the disabled, widows, pupils, prisons, students, and people at risk who need our support but we thank God that we are able to help some of them with your partnership in this work. It is our hope and earnest prayers that you are doing your very best in all your endeavours, especially in your service in the Kingdom of God and in different communities around the world. PHOTO ABOVE: SUNDAY SCHOOL CHILDREN ACT A PLAY ON THE FIRST SUNDAY WORSHIP SERVICE OF THE YEAR 2018. THEME OF THE YEAR 2018 IS ‘ENLARGE YOUR TENT … STRENGTHEN YOUR STAKES (ISAIAH 54:2). People For Jesus Ministry has a mission team or Mission Council that plans and implements local, regional and international missions and outreach programmes. That includes crusades, church planting, prayers and intercessory prayers, community evangelistic Outreach programmes and projects. The team also mobilizes, recruits, sends and support long-term and short-term missionaries and teams to different parts of the world. The Mission Team also hosts volunteer missionaries from every part of the world. The Mission Council meets every month to pray, plan and implement Church missions and outreach programmes. Please contact us for details on how you can participate in any of our short term and long term missions/outreach programmes/projects. PHOTO ABOVE: GOSPEL PREACHING AT OLOPITO SUB-LOCATION AREA OF NAROK COUNTY IN KENYA IN JANUARY 2018. THE CHURCH IS PLANNING TO PLANT A NEW CHURCH IN THAT AREA. THE VILLAGE WE ARE TARGETING (WHERE WE WERE PREACHING) HAS A POPULATION OF ABOUT 1000 PEOPLE BUT THERE ARE TWO CHURCHES THAT ARE FAR FROM WHERE THE PREACHING WAS TAKING PLACE. THE VILLAGE IS INHABITED BY THE MAASAI NOMADIC PEOPLE. PHOTO ABOVE: ANNUAL SHARE-OUT DAY ON 3RD JANUARY 2018 FOR THE BUSINESS AND COMMUNITY EMPOWERMENT DEPARTMENT OF THE CHURCH AT NAROK TOWN CHURCH. IT IS KNOWN AS MAASAI COMMUNITY DEVELOPMENT AND YOUTH PROGRESS (MACODEYOP). The construction of Kandaria Secondary School two extra classrooms that was launched by the Church in October 2017, was completed by the end of the first week of January 2018. The funds for the construction of the two extra classrooms were used wisely and a little left over funds were used to dig a water well, set up water tank high level gravity platform, buy large plastic water tanks and to pipe water in the school compound and to the school laboratory. The school now has its own source of clean drinking water. The classrooms are some of the best in that region with a good verandah and tile floors which is not a common place in the classrooms construction in Kenya. Lots and lots of thanks to the partners who supported such an extra ordinary project with a ripple effect. PHOTO ABOVE: KANDARIA SECONDARY SCHOOL TWO EXTRA CLASSROOMS LAUNCHED ON 19TH OCTOBER 2017 ARE NOW COMPLETE AND USABLE BY THE FIRST WEEK OF JANUARY 2018. PHOTO ABOVE: KANDARIA SECONDARY SCHOOL WATER PROJECT. The Church has a disabled centre in Nairobi at Kayole known as Hekalu Disabled Support Centre. The PFJM Church and their partners support the disabled centre by giving wheel chairs, food, furniture, physiotherapy equipment, etc. The disabled centre is currently located within the PFJM Kayole Nairobi Church compound. The children are many. Brailes are needed for special reading and writing. Physiotherapy equipment and financial support is needed for the many needs of the disable children. The number of disabled children applicants who need help are increasing each day, but we cannot take in more since we do not have enough space and sufficient facilities for more than the number we currently assist. NAROK TOWN CHURCH IS STILL SEEKING FOR SUPPORT FOR THE PURCHASE OF LAND AND THE CONSTRUCTION OF A CHURCH SANCTUARY. PLEASE KEEP US IN PRAYERS SO THAT WE RAISE £35,000 FOR THE WHOLE PROJECT. NAROK TOWN CHURCH MEMBERS HERE IN KENYA CONTINUE TO CONDUCT SOME FUNDSDRIVES. THE PIECE OF LAND WAS IDENTIFIED IN FEBRUARY 2018. LOCATED 1 KILOMETRE AWAY FROM NAROK TOWN. SIZE OF LAND IS ½ ACRE. COST OF LAND ONLY IS £10,000. COST OF SANCTUARY CONSTRUCTION IS £25,000. HUGH HENDERSON – £300. PLEASE JOIN US IN RAISING THE FUNDS. WE NEED TO RAISE £10,000 FOR LAND IN 2018 AND 2019. IF WE GET LAND FUNDS IN 2018, THEN WE CAN BEGIN TO BUILD THE CHURCH SANCTUARY. YOUR SUPPORT IS VALUABLE. VERY SPECIAL THANKS TO ALL THE FRIENDS WHO HAVE ALREADY MADE THEIR GENEROUS AND SACRIFICIAL DONATIONS. 23RD, 24TH, 25TH AND 26TH FEBRUARY 2018 – KISII RUGA NEW CHURCH PLANTING MISSION. The missions/outreach council sent pastor Tom and sister Jane to Ruga in Kisii in Kenya for a new Church plant launch, about 250 kilomtres west of Narok town. They conducted crusades and leadership seminars. They also preached on Sunday 25th February 2018. A branch Church was launched. Glory to God for a good work. FAMILY ISSUES: THE YOUNGEST SON TO PASTOR TOM, JOSHUA HUGH, WHO IS THREE YEARS AND FIVE MONTHS OLD IS FINE. DAUGHTER DEBORAH OF 9 YEARS AND NINE MONTHS OLD IS NOW IN PRIMARY 4 CLASS. PETER OF 14 YEARS OF AGE IS NOW A CANDIDATE IN PRIMARY SCHOOL AND JOINS SECONDARY SCHOOL IN THE YEAR 2019. MY HOUSE IN THE UPCOUNTRY VILLAGE IS NOT YET COMPLETE. WE NEED US$20,000 TO COMPLETE THE CONSTRUCTION OF THE HOUSE. HELP IS SURELY NEEDED IN THAT ENDEAVOUR. EUNICE AND PASTOR TOM ARE BUSY AS USUAL WITH MISSIONS AND OUTREACH PROGRAMMES IN SERVICE TO THE LORD. THANKS FOR YOUR PRAYERS AND KEEP ON STANDING WITH US. PHOTO ABOVE: PASTOR TOM CONDUCTING A CHURCH LEADERS TRAINING AT THE NEWLY PLANTED BRANCH CHURCH IN RUGA, KISII AREA IN KENYA ON 24TH FEBRUARY 2018. The Church launched a serious ‘school drop outs back to school’ campaign programme in February 2014 as part of the Church sponsorship programme. The programme is targeting pupils/students who dropped out of school for various reasons especially among the Maasai communities in Narok county. We have thus far managed to support some pupils/students beneficiaries in the programme. Thanks to those who responded to our plea to help school drop outs plus those who have not been able to make it to school to go to school. We have not yet reached our target and many more children who need to go to school are increasing. YOU CAN GIVE AS LITTLE AS £15 PER MONTH OR £180 PER YEAR, US$25 PER MONTH OR US$300 PER YEAR TO ENABLE A STUDENT GO BACK TO GOVERNMENT DAY SECONDARY SCHOOL. About half of the funds is used for the purchase of school uniforms. You can also help a child go back to primary school by giving US$100 per year. THE CHILDREN/STUDENTS BEING SPONSORED ARE FINE AND DOING THEIR VERY BEST IN SCHOOL. WE THANK ALL SPONSORS HELPING THE ORPHANS AND VULNERABLE CHILDREN/STUDENTS. PHOTO BELOW: PASTOR TOM PREACHING AT RUGA IN FEBRUARY 2018. THE MAASAI VILLAGE ADULT/LITERACY CLASS CURRENTLY ON HOLD. 85% OF THE CLASS ARE WOMEN AND GIRLS. THE PROBLEM OF EARLY MARRIAGES AMONG THE MAASAI GIRLS NECESSITATES THAT THEY DROP OUT OF SCHOOL OR NEVER MAKE IT TO SCHOOL SO THAT THEY GET MARRIED AND EARN THEIR FAMILY A WEALTH OF MANY COWS PAID AS DOWRY. THE CHURCH IS ADDRESSING THAT EDUCATION GAP BY CONDUCTING CLASSES FOR THOSE WHO HAVE EITHER DROPPED OUT OF SCHOOL OR THOSE WHO NEVER MADE IT TO ANY SCHOOL. THANKS TO THOSE WHO HAVE BEEN ABLE TO SUPPORT US. PLEASE JOIN US IN THIS ENDEAVOUR AT USD$70 PER MONTH PER CLASS. CURRENTLY, DROUGHT HAS BEEN DISRUPTING OUR CLASSES SINCE THE MAASAI COMMUNITY ARE BASICALLY PASTORALISTS AND THEY HAVE TO LOOK FOR PASTURE AND WATER FOR THEIR LIVESTOCK. THE CLASSES WILL RESUME AS SOON AS WE HAVE THE FUNDS. WE HAVE INTERGRATED CLASSES WITH INCOME GENERATING ACTIVITY TO ENABLE ADULTS EARN A LIVING AS THEY LEARN. WE CALL IT ‘FEED BOTH THE MIND AND THE BODY’. Our Tanzania Overseer, Pastor Samuel Mbanga, runs the Church School of Ministry at Morogoro province and also leads the Morogoro churches and Dar Esaalam Church alongside other pastors and leaders. We have four local Churches in Morogoro and one local Church at Dar Esalaam. The Church runs a nursery school in Morogoro and in Dar Esalaam. Keep us in prayers as Kenya missions/outreach team plans to travel there in late August 2018. We need to build the Church sanctuaries and to build the School of Ministry and the nursery/primary schools in Dar Esalaam and Morogoro. >>> Missions/Outreach Council: Church plants in Kenya at Mount Elgon and Narok areas – Olopito, Lariak, Olooltoto centre and Syapei, Ruga and Oyugis. Church plant in Pakistan in October 2018. Church planting survey in Liberia, and Uganda. 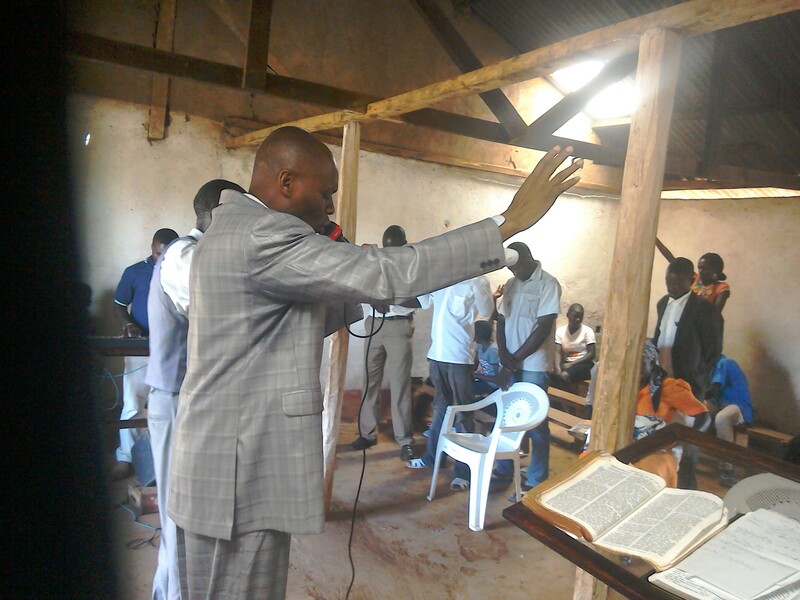 Church plant visits in Kenya in Nyamkebe, Nyakach, Eldoret and Nairobi. Mission trip to Kampala Uganda in March 2018. Mission trip and graduation of Bible class in PFJM Tanzania in August 2018. Gospel outreaches/evangelistic campaigns in Kenya. >>> Adult/Literacy education classes among the Maasai community of Narok Kenya. >>>Funds-drives for the Narok town Church purchase of land and building of Church Sanctuary. >>> Supply computers and begin computer learning classes at PFJM Narok town Church. >>> Education sponsorship programmes. Support programmes for poor and needy children/people/communities. >>>Visit and support mobilization for disabled centres in Nairobi Kenya. >>>Bible school establishment in Kenya. >>> Construction of a nursery and a primary school at Olooltoto area of Maasai land in Narok within Kenya. >>>Children Vocational Bible School camp. >>>Youth camp and quarterly youth rallies. >>> Other Youth, women, children, programmes. End year celebration, Big meal celebration, etc. >>> Annual PFJM National leadership conference on 21st – 23rd November 2018. National Church Leadership Empowerment Conference at Narok. PHOTO ABOVE: PASTOR TOM (RED AND BLACK SHIRT ON THE RIGHT AT THE FRONT) ATTENDING AFRICAN PASTORS FELLOWSHIP CONFERENCE IN KAMPALA UGANDA IN MARCH 2018. PFJM has established a self-help project called ”Cluster Dynamics” which are designed to pull together groups of 5, 10 or 15 people from within a community group who are mutually in great need. The groups are tasked with developing a micro-project which will generate income for the group in order that they can support themselves and their families. The groups mainly made up of destitute women, are poor for a number of reasons but mainly due to the tragedy of HIV/AIDS which affects each family in one way or another. Some suffer from the disease themselves, others as a result of losing their husband by HIV/AIDS. The result is that the remaining partner (usually wife and mother) is left to support a number of children. PFJM can help these groups get established by providing one time initial set up grant of £500, 1000 and 1500 respectively, allowing them to get going with their project and bring in the much needed income that will grow the project and support the group and their dependants. PFJM will closely monitor the projects to ensure that they are profitable to the groups. You can invest in this worthy course that can profitably change lives of the poor widows and others for a life time. Currently, we have the groups of 5, 10 and 15 ready to move with any support that comes to them. ON 3RD JANUARY 2018, THE THIRD CLUSTER GROUP SHARED THEIR ANNUAL PROFITS. PLEASE HELP THESE POOR PEOPLE TRANSFORM THEIR LIVES BY YOUR ONE TIME SUPPORT. The mission work we are involved in is too dynamic and enormous for us to do on our own. We surely appreciate your partnership by prayer, support, and personal involvement. Narok Town Headquarters Church Land Purchase and Church Building at a cost of United Kingdom Pounds £35,000 or US$42,000. We thank all who have thus far donated. We have identified a piece of land in Narok town which costs US$15,000 (£10,000). The land is not yet bought due to insufficient funds. We need to have US$7000 to pay deposit for land then we pay the rest for the next two years. Orphans and Destitute children monthly support £20 or US$35. This year we have many needy children in the programme awaiting support. Needy College/University Students support and High School Students support needed. New Church Planting Mission in Pakistan at Lahore . Pakistan pastor being trained by PFJM so that he takes over the work. Other Church plants in Africa e.g.. in Ruga in Kisii area Kitale, Mumias, Mt. Elgon, Narok Olopito, Narok Lariak, Narok Olooltoto centre, Katolo in Kenya, Liberia, Uganda in Lira, etc. We need Church Sanctuary and Primary school buildings in Tanzania Church. School, orphanage, clinic and guest house Building proposals in Narok and in Kisumu areas in Kenya. Mission Emphasis Programmes and community development projects in Kenya going on throughout the year. PFJM Tanzania Church needs prayers: To be officially registered by the Tanzania government. Bible school graduation to be held in August 2018. That church needs to build a sanctuary in five different places we have Church plants. Thanks to God because Africa Pastors Fellowship launched a dynamic Church leadership app in Kampala Uganda on 12th to 16th March 2018 in which People For Jesus Ministry participated. The app is dubbed EVITABU. Pray for missions/outreach work in the year 2018 in places such as Ruga in Kisii Kenya, Elgon and in other places, Church plant survey in Liberia in November 2018, Tanzania outreach in August 2018 at Dar Esalaam and Morogoro. Annual missions/outreach emphasis months in June through to October 2018. Thanks to God for the completion of two extra classrooms at Kandaria secondary school and for the ripple effect of the water project. Pray for Church Annual General Meeting to be held on 24th November 2018. Pray for Church Annual National Church Leaders conference for 21st to 23rd November 2018. Pray for the Big Meal 2018 events for the needy children feeding and awards programme on Christmas Day. Also pray for the End of Year seminar and end year prayer vigil. SPECIAL THANKS TO ALL OF YOU FOR YOUR PRAYERS, SUPPORT AND ACTUAL PERSONAL PARTICIPATION IN THE WORK THAT WE DO. BECAUSE OF YOUR PARTNERSHIP, WE ARE ABLE TO MEET EDUCATION AND MATERIAL NEEDS OF MAASAI COMMUNITIES IN NAROK AND AROUND THE NATION OF KENYA, BESIDES SERVING OTHER PEOPLE. YOU HAVE ALSO ENABLED US TO PREACH THE TRUE GOSPEL AS WE MAKE DISCIPLES OF CHRIST IN KENYA AND IN OTHER NATIONS. WE ASK YOU TO KEEP ON STANDING WITH US FOR THE SAKE OF THE WORK OF GOD’S KINGDOM AND FOR MINISTERING TO POOR/NEEDY COMMUNITIES. THE YEAR 2018: THE THEME OF THE YEAR IS; ”ENLARGE YOUR TENT….STRENGTHEN YOUR STAKES. YOUR PARTNERSHIP IS GREATLY VALUED (PHILIPPIANS 1:5). THANK YOU!! !